Your questions are about to be answered. Logs can rot for many reasons and repairs are tough. Look out for easily repairable cracks and checks. Look here for tips on diagnosing and addressing damage caused by insects. What should you do about dark, flaking, or built-up stain? Learn about the chinking issues affecting your logs. Log railings look great, but a lot can go wrong. Issues with “cabin logs” are common but help is here. See the specialty services we perform with expertise. Edmunds & Company Log Home Restoration are the log home problem-solvers! No matter what ails your treasured cabin or home, we can help. Our experienced, knowledgeable team offers repair and restoration services for all sizes of log homes, cabins and buildings. Don’t settle for anything less than the best when it comes to your family legacy, your log home. 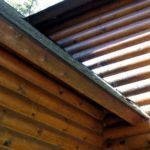 With over 40 years of experience, we’ve pretty much uncovered just about every type of problem possible in a log cabin or home. However, certain problems are very common in Wisconsin, Minnesota and the surrounding areas we service. 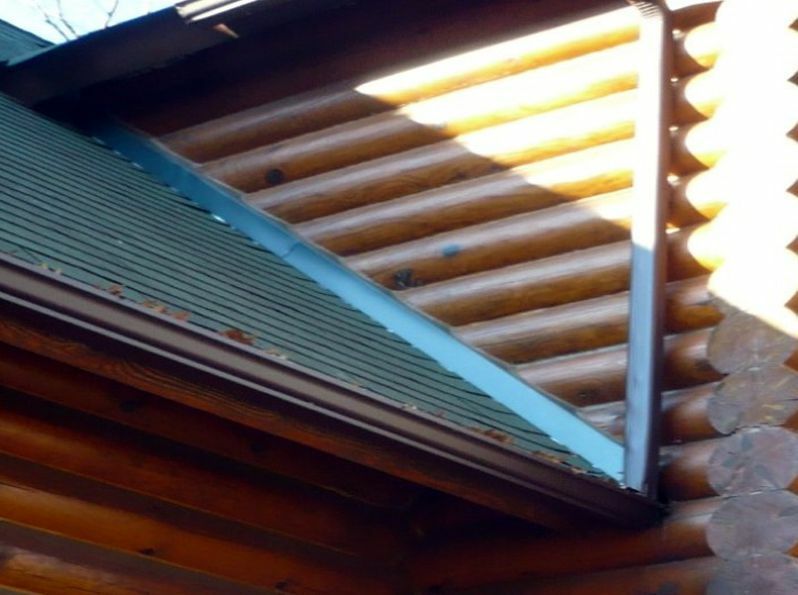 No matter what the problem, Edmunds & Company Log Home Restorations has the experience, knowledge and expertise in a wide range of services to fix it. A log home isn’t just a dwelling. It’s a family legacy, a treasured investment. It’s a place you go to relax, to enjoy life in the outdoors. 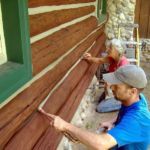 Make sure your log home or cabin is restored to perfection. Call the experienced log home restoration professionals at Edmunds & Company for an estimate. 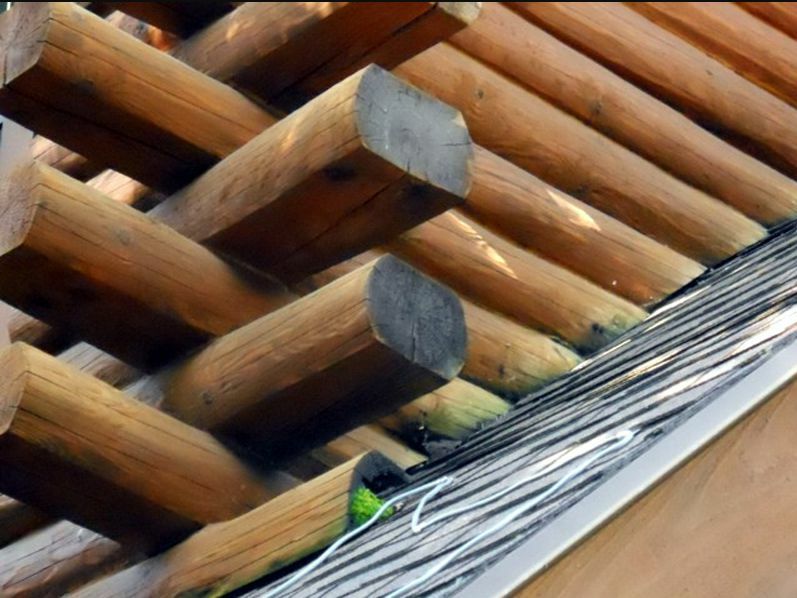 Serving Minnesota, Wisconsin and nearby areas with log home repair and restoration services. See some common problems below and our recommended solutions. This roof was not properly flashed and the logs along this valley have rotted. The rotten logs were replaced and the roof is now properly flashed so that the water running down this valley will not touch the logs. This is another look at what can happen if there is not flashing between a roof and where the logs meet. Chinking is applied using a pump applicator and then smoothed by hand to insure a good seal between chink and logs. 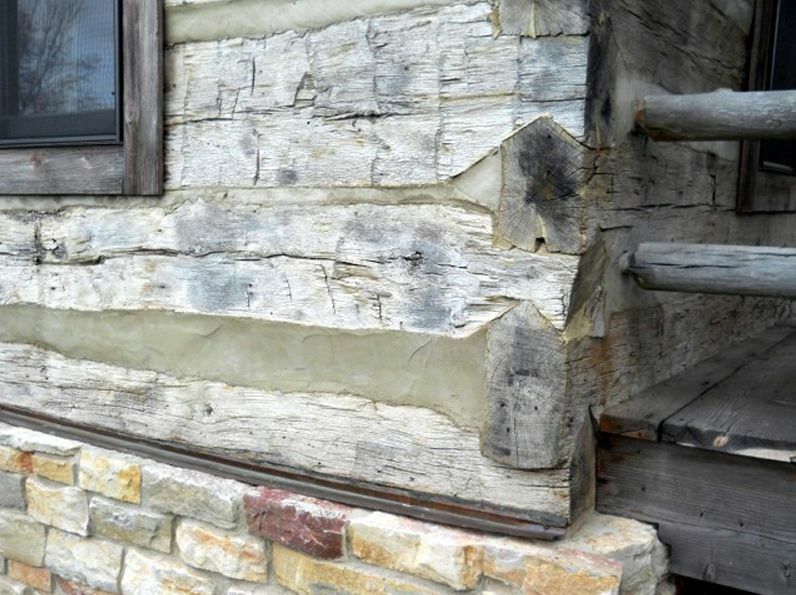 This is a good example of the use of mortar chinking on an historic, hand-hewn log building. 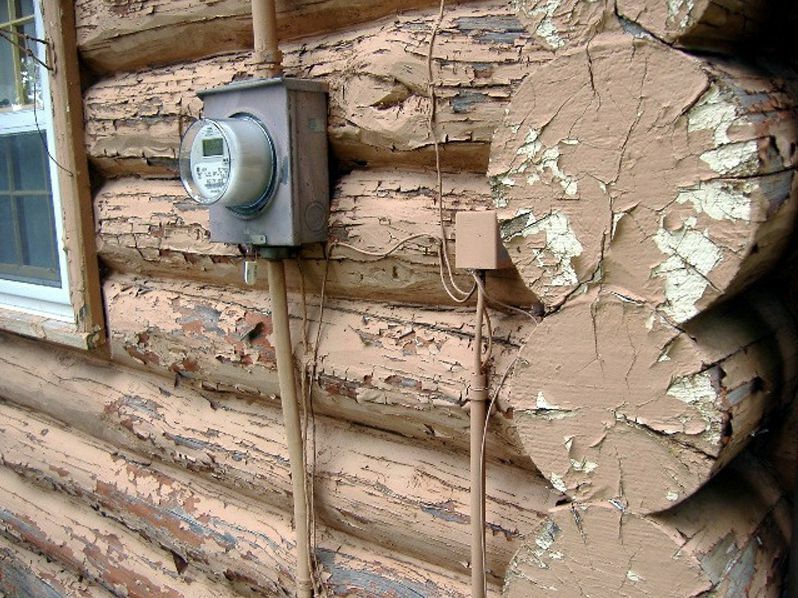 Layers of paint build up and don’t allow the logs to breath. Eventually, the paint peels and no longer protects the logs. In this situation, the logs had to be sandblasted and a new finish applied. In this case, the paint buildup caused significant rot. The rotten logs needed to be replaced and the building needed sandblasting to remove the layers of paint. There are many reasons why logs rot. This is a common one. 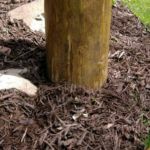 This pine post was surrounded by mulch and soil and the footing was poured below grade so the bottom of the post was allowed to soak up moisture. As you can see, these conditions caused the post to rot. 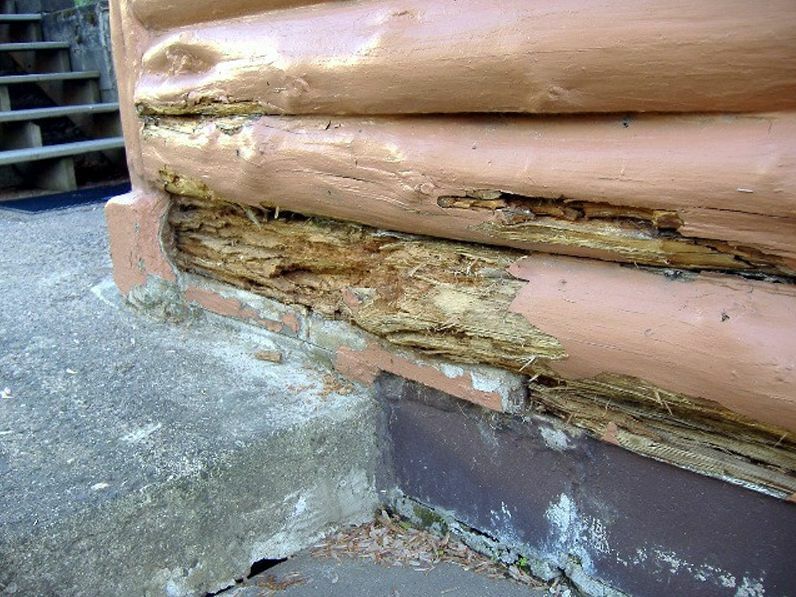 This type of rot will eventually cause the post to collapse. Here is a correctly installed Western cedar post. It is above grade and has a galvanized steel spacer installed between the post and the footing. In this photo, notice the up-facing cracks that let the moisture in and the finish build up that would not let it out. This eventually caused this log to rot. There seems to be rotting wood below the roof where it meets the log wall. What could have caused this? 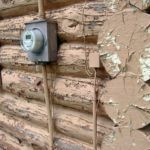 Edmunds & Company has seen logs with rot in areas like this in our inspections of log homes. It is particularly difficult to manage water on upper rooflines. 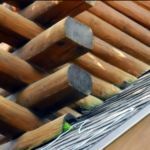 At the same time, if the water coming off the roof regularly falls on lower logs, you may soon see deterioration of finishes as well as rot start to develop. There is a proper way to flash an upper roofline to a lower one. Click here to see a PDF on how this is done. This drawing shows the proper way to flash an upper log wall to a lower roof system. 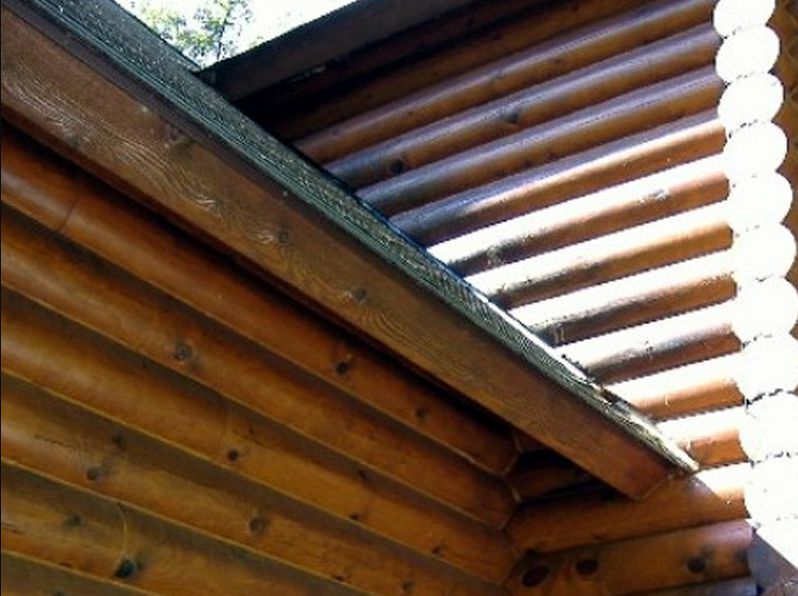 Properly installed and clean gutters can also help keep water off the logs. 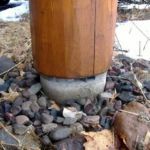 Should I consider using synthetic chinking on my old log home rather than the original mortar chinking? 1. It doesn’t make a proper seal between the logs. 2. It tends to hold moisture up against the logs, possibly adding to the potential for rot. Today, synthetic chinking such as the Perma-Chink brand is routinely used instead of mortar. 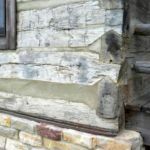 This “modern” chinking has much the same appearance as the old mortar but, unlike mortar, it will seal completely and not soak up moisture, which will help to prevent rot. Many times, new chink can be applied over existing mortar chinking but in other situations, the mortar chink needs to be removed before the synthetic chink can be installed. It’s good to get a professional opinion to decide which is the right fix. Call 715-373-5744 to get your questions answered. Why can’t I just paint my log cabin? Layers of paint build up and don’t allow the logs to breathe. Eventually, the paint peels and no longer protects the logs. In this situation, the logs had to be sandblasted and a new finish applied. Paint buildup can cause significant rot. Then the rotten logs need to be replaced and the building will need sandblasting to remove the layers of paint. There are many reasons why logs rot. This is a common one. I see rot at the bottoms of my log posts. What can be done to prevent or fix this problem? 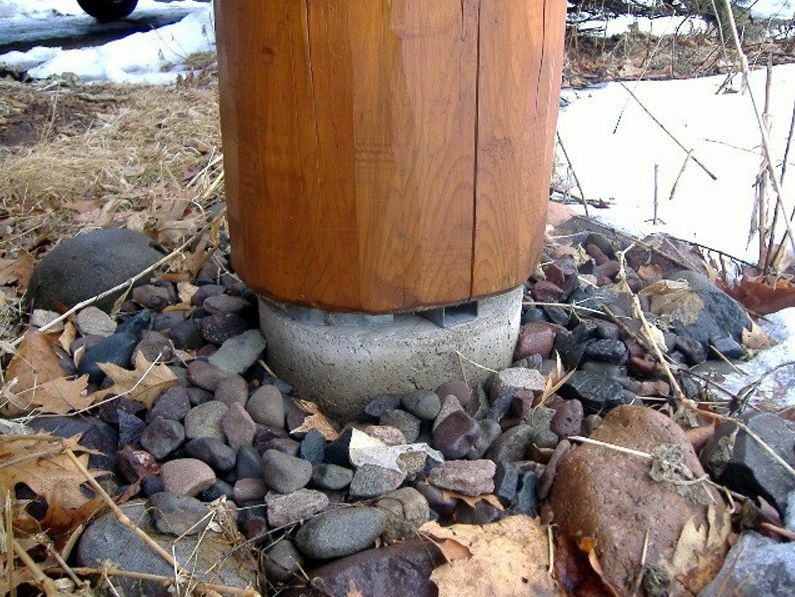 It is very important to provide adequate airflow under and around your log columns or posts. Cedar logs are the most rot-resistant wood to use where the logs are directly out in the weather. 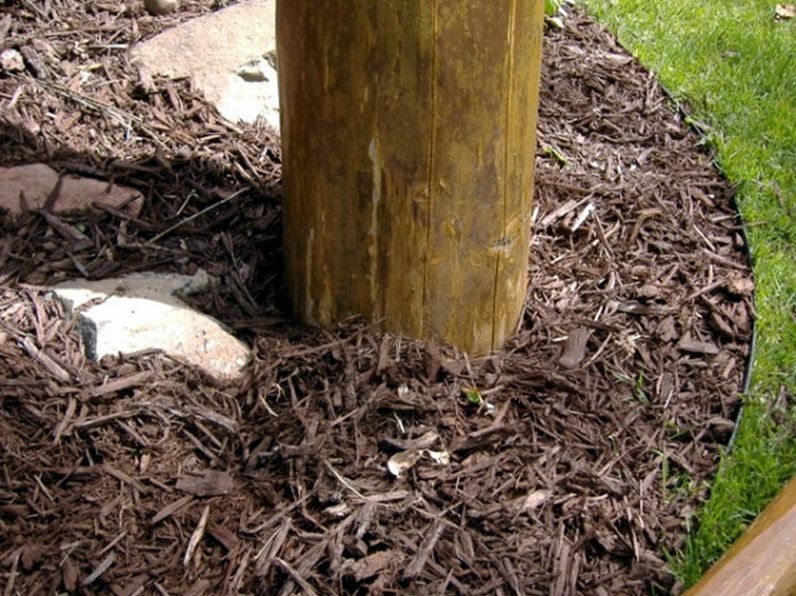 Edmunds & Company uses a combination of tactics to prevent decay in these exposed and vulnerable posts. A stand-off base is installed to allow airflow around the base of the post and a borate treatment is used on particularly rot- susceptible areas of the posts to further insure against decay. 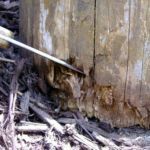 See below for some photo illustrations of decay on these posts and what can be done to prevent this rot. Edmunds & Company has the expertise to replace just about any type of post anywhere on your home. Contact us. I see an area on my log house where the logs are darkening and the log seems to be soft. What is happening? Basically what is happening is that moisture is building up behind the finish and causing the log to rot. Too much finish can form an impermeable layer on the surface of the log. 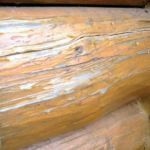 Moisture (in the form of rain or snow) is always making its way into the logs – most likely through a crack or check on the surface. Once inside the log, it soaks into the wood. Then when the rain stops, the moisture tries to make its way out that crack again AND since the moisture has dissipated into the log’s core – it is also trying to make its way out via the entire surface of the log. Now, the moisture content is high in the log, which is a precursor to rot forming. To a large degree, a finish that can no longer breathe traps the moisture between it and the log. This situation eventually causes rot. 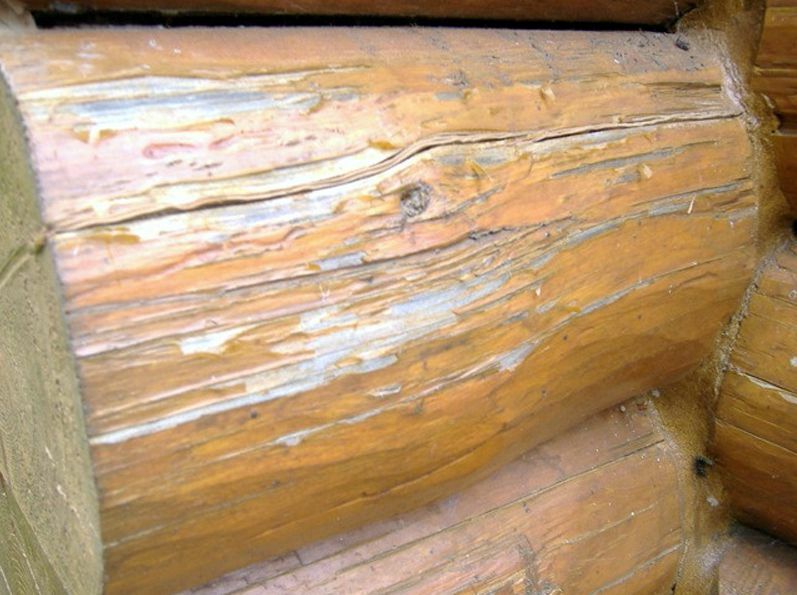 Any time moisture is allowed to build up within a log, the conditions for rot are ideal. 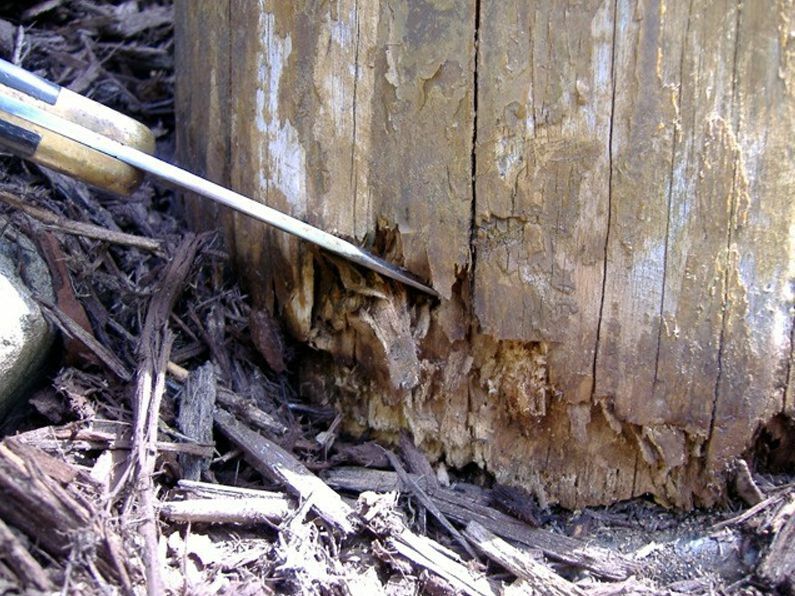 Click here to learn more about why logs rot. 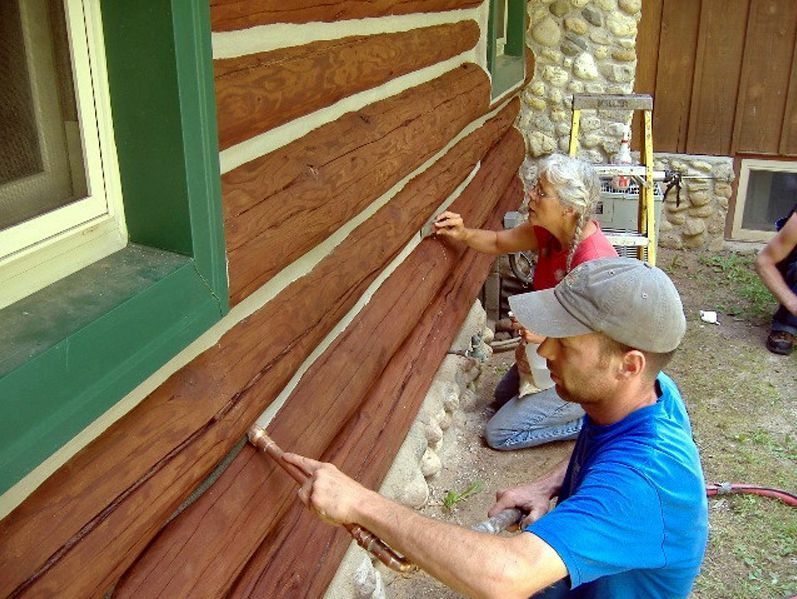 For more information on how to restore the beauty of your log home finish/stain, click here. This type of problem tends to be on more modern, hand-scribed homes that have a type of finish that builds up a film with each application. 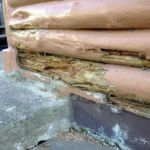 These conditions can cause the “perfect storm” for rot because this build up of finish has formed a veritable “plastic bag” on the outside of the logs, trapping moisture, and the logs can rot – even on homes that are less than 10 years old! 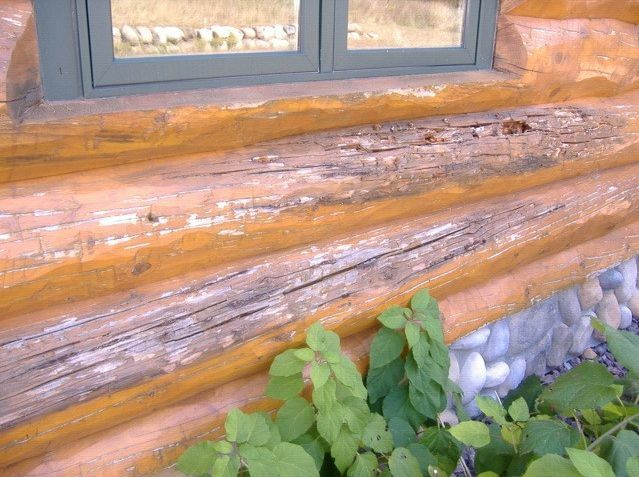 In the case of newer homes like these, the logs have a relatively high moisture content to begin with (new logs are often green), which is compounded when the “film building” finish is applied. Problems can arise after even the second or third coat of this type of finish. Our experience has shown that many of these buildings start off with a finish that is breathable enough, but once the second or third coat is applied, the finish becomes too thick (builds up) and forms a barrier to the logs breathing. Do you have questions about your log home. Call Edmunds & Company and talk to experts in log home restoration. 715-373-5744 or contact us. 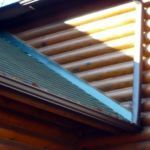 Log home problems – Why leaks happen and how to prevent them One problem with log homes is that they can leak…. 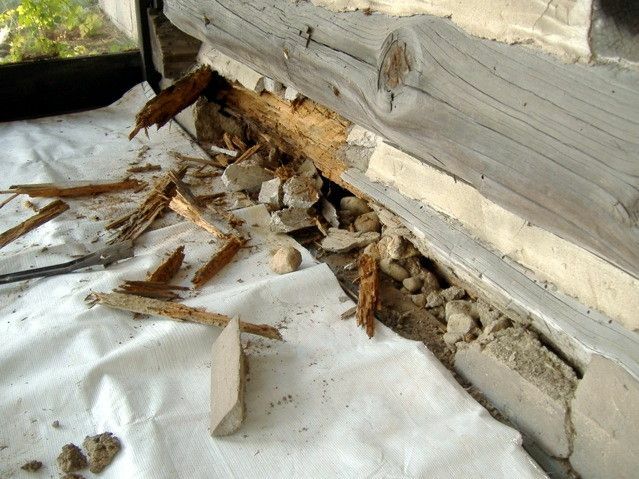 Log Home Repair When Mortar Chinking Needs to Go Log home repair and re-chinking are services that we specialize in….